When it rains in summer I think about Krishna. As I left this morning to teach, I watched the sun fading behind storm clouds and on my walk to the studio a few heavy drops landed before the entire sky exploded from its own heat. Whatever plan I had for the class was gone, having been blurred and dispersed by the downpour. So… Once upon a time, I told my class, the monsoon came to the cow-herding town of Vrindavan. The plants bloomed – a passionate chaos of fecundity. The most lavishly-petalled flowers and fruits burst forth in every conceivable jewel tone within the deep ripe green of the jungle. Some glowed red like embers, others were stained with shocking spills of pink and orange, and a few shone with the intoxicating midnight blue of Krishna’s skin. The jungle vines grew rapidly into thick tangles as the cows in the nearby pastures grew fat and healthy from the grass. Adding to the exuberance of the landscape, Krishna played a few notes of love on his flute; some were as deep and private as the darkest earth and others were thin, reedy and wistful like a bird’s cry. 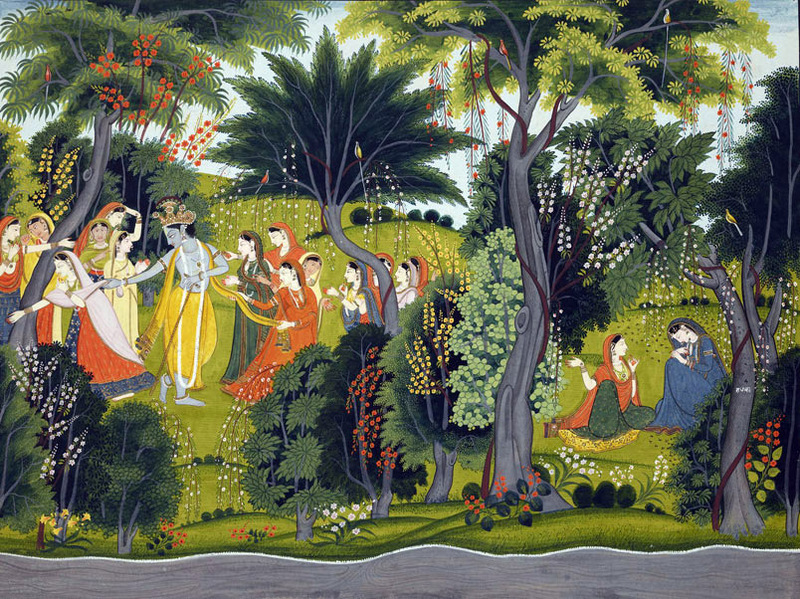 The Gopis, Krishna’s beloved milkmaids, began to swoon with love, dropping their milk pails and abandoning their chores to follow the trail of Krishna’s music into the forest, the bright colors of their saris mingling with the plants so that they looked like moving blossoms. 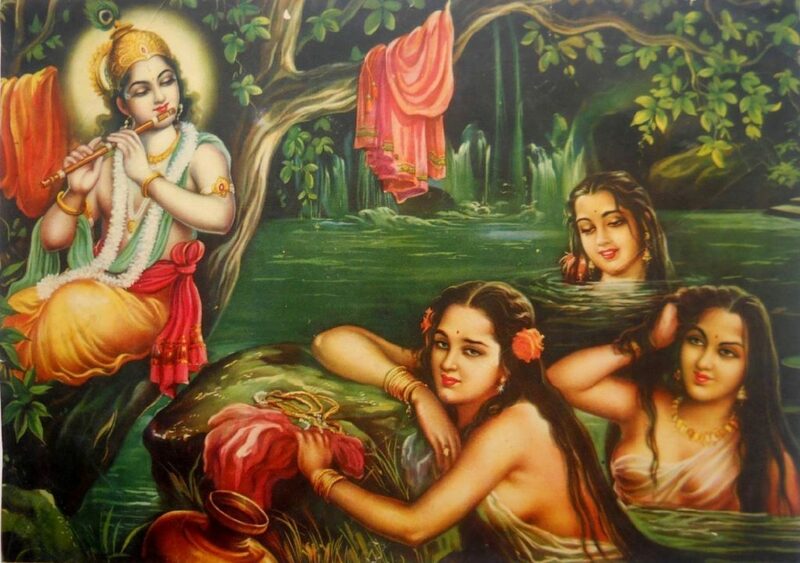 They began to play games deep in the forest as Krishna flirted and seduced them one by one, until each had discarded her clothing to bathe naked in the lake. To tease them, Krishna gathered up their clothing and climbed high up into a tree then called down to them. “Look,” he said, I’m up here!” and playfully waved an armful of sari silk at them. Their love-dampened eyes lifted. They smiled and laughed. In love, in love, in love… with the music, with the forest, with Krishna. The waters surrounded them and the waters trickled down on them, filtered by the leaves and vines of the forest. They were lost in love. Imagine, I said to my class, that the story is happening inside of you. This is your inner landscape. You are the seducer and the seduced. The forest is your heart and the lake is your consciousness. You are the ripe earthiness of the forest floor and the cultured beauty of the women’s woven saris. You are the placid unquestioning cows and the yearning and intoxicated women. The music is your breath and you are falling in love with yourself. 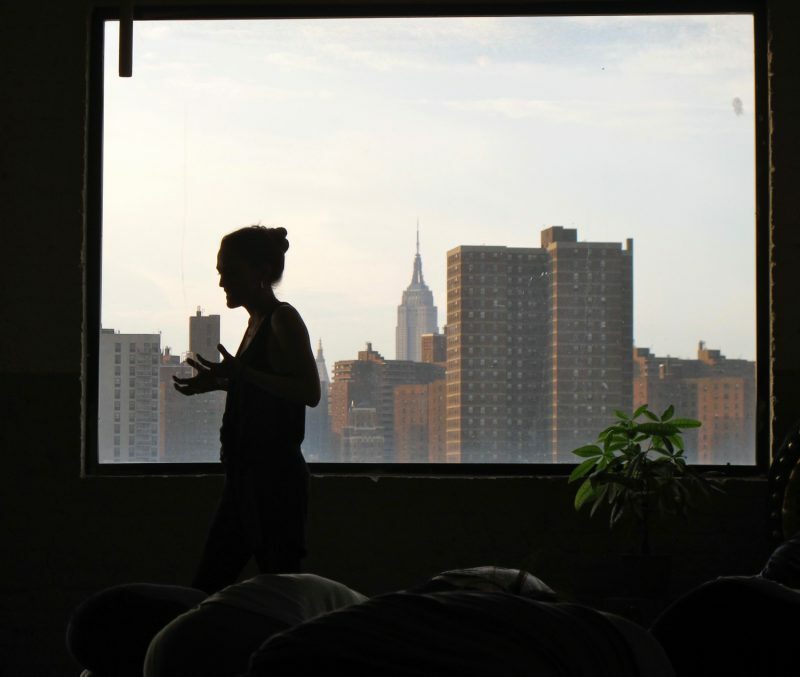 The purpose of your practice is to follow the breath in order to weave your own story. So what is the story of your practice? How can you fall ever more deeply in love with your life? And how can you inhabit this inner landscape so thoroughly that it stays with you through whatever challenges you encounter and wherever you choose to go?